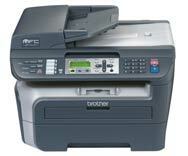 Brother’s MFC-7840W is a multifunction device with a monochrome laser printer, copier, scanner, fax machine, and wired and wireless networking. Budget-conscious users will especially appreciate the MFC-7840W’s inexpensive cost per print (approximately $0.03 per page). Capable of printing very good quality text and business graphics at reasonably fast rates, the MFC-7840W is a fine choice for offices that work in a black-and-white world. Setup is a snap. After powering up the machine and installing the toner cartridge, you have three connection options: Ethernet, USB 2.0, or 802.11b/g wireless. The USB connection is plug and play, and when we connected the printer via Ethernet, the MFC-7840W automatically appeared on our Mac as a Bonjour printer. The trickiest connection was the wireless, which required setting up IP printing. After some time flipping through the user manual, we figured it out and wireless printing worked smoothly. The device’s control panel is well designed and clearly labeled. Three large buttons allow you to choose between the fax, scan, and copy functions. The control panel consists of rubber buttons, and a bright, backlit LCD clearly displays the settings you can choose from. Disappointingly, the included scanner software doesn’t offer flexible scanning options. Though straightforward to use, the software doesn’t allow you to perform a full preview scan. The scanner performs a preview scan on specific parts of the glass based on the document size you select, requiring you to be very precise about where you place your documents on the glass. The MFC-7840W output had very good results overall, impressing our panel of experts. Text quality in a Word document looked clean and professional, earning a Very Good rating. We also printed a document containing mixed elements, including fine, curved lines and graphics, which earned another Very Good rating. The scanner’s output was too heavy on the blues compared to our control image, earning a Good rating. The MFC-9840CDW’s copier received a Good rating: in a test copy of a Macworld magazine cover, some details was lost, and shadows lacked detail. Print speeds were reasonably fast. It took just under 38 seconds to print a ten-page Word document, and 17 seconds to print a one-page Word document. Color scanning was a bit on the slower side: it took 1 minute and 57 seconds to scan an 8-by-10-inch photo at 600 dpi. Since the MFC-7840W is a monochrome multifunction device, you only have to worry about replacing one toner cartridge. For $45, you can purchase the standard toner cartridge, which Brother estimates will yield 1,500 pages-that’s about $0.03 per print. Keep in mind that eventually you have to replace the drum unit, which costs $100 and has an estimated yield of 12,000 pages. As always, these page rating are estimates; just how much you’ll get out of each toner cartridge and drum unit depends on the types of documents you’re printing. At $300, the MFC-7840W is a bargain. If you don’t mind a bare-bones scanner driver and you mostly print text and business charts and graphs, you’ll enjoy this versatile device that won’t take a bite into your budget.